Corned beef and cabbage is considered a traditional meal for St. Patrick's Day. But you won't find anyone in the Emerald Isle feasting on it come March 17. That's because the tradition was started in America by Irish immigrants. They were accustomed to eating bacon (more like ham than the American version) and cabbage. But bacon was too expensive, so they turned to corned beef as a substitute. If you want to experiement with something more authentic this St. Patrick's Day, try Dublin coddle or lamb stew, two of Ireland's most well-loved dishes. You can also incorporate a little Guinness into your cooking for a true taste of Ireland. 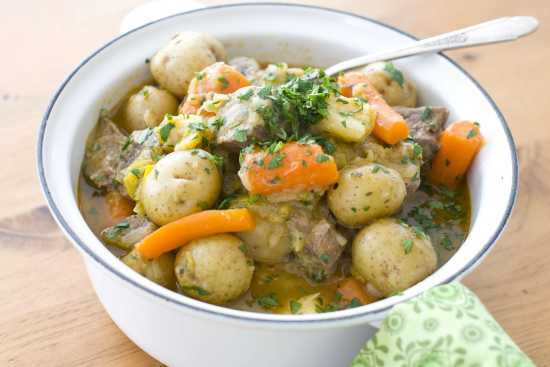 If you're a purist, Irish stew is one of the easiest dishes to make for St. Patrick's Day. That's because according to culinary lore, the only ingredients are lamb, potatoes, onions and water. Supposedly, adding anything else clouds the true flavors of the stew. And if you're really going to stay true to tradition, all you're allowed to do is dump those ingredients in a pot (preferably over an open fire) and walk away for the day. The good news is that making a far more flavorful version of this stew isn't all that difficult, and your efforts are rewarded with a rich, brothy meal with layers of flavor that complement rather than compete with the core ingredients. And no open fire or all-day simmering needed. Season the lamb with salt and pepper. In a large Dutch oven or heavy bottomed pan over medium-high, heat the oil. Working in batches, Add the lamb to the pan and sear on all sides, making sure not to overcrowd the pan. As each batch is browned, use a slotted spoon or tongs to transfer it to a plate. When all the lamb has been seared, add it all back to the pan. Add the leeks, onions, carrots, parsnips, broth, bay leaves and thyme. Bring the mixture to a simmer, then cover and cook for 1 hour. After 1 hour, add the potatoes and continue to cook until the potatoes and the lamb are tender when pierced with a fork, about another 30 minutes. Remove the bay leaves and thyme stems. Stir in the parsley and season with additional salt and black pepper, if needed. Dublin coddle is considered one of Ireland's national dishes. But like many of Ireland's great foods, it is rich in fat. Traditionally made with both bacon and sausage to flavor a base of potatoes and onions, Dublin coddle is an insanely good one-dish meal. This slimmed-down version (swapping in lower-fat Canadian bacon and chicken sausage, boosting the number of veggies) would be a great choice for St. Patrick's Day. In a large Dutch oven over medium-high, heat the oil. Add the Canadian bacon and saute until lightly browned, 3 to 4 minutes. Using a slotted spoon, transfer the bacon to a small bowl. Add the sausage to the pan and brown the slices on both sides, about 3 to 4 minutes per side. Transfer the sausage to the bowl of bacon. Add the onions and garlic to the pan, then saute for 7 to 8 minutes, or until they begin to brown. Stir in the sage, thyme and parsley. 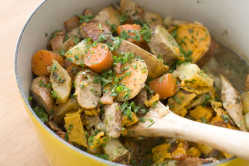 Add the russet and sweet potatoes, carrots, apples and reserved meat. Pour the apple cider and chicken stock over everything. Cover and set over medium-low heat. Cook until the vegetables and potatoes are very tender, about 1 to 1 1/2 hours. Season with salt and pepper. If you don't want to spend St. Patrick's Day in a crowded pub, celebrate at home with Guinnes, the quintessential Irish beer. Enjoy it in a pint glass and in you're cooking. Guiness and beef are a wonderful combination. Serve these sandwichs with a side of cabbage and potatoes for a delicous taste of Ireland. Use paper towels to pat dry the steak, then set it in a glass or stainless steel container with a tight cover. Pour the Guinness over the steak and set aside. Cut the onion into 1/2-inch-thick slices. Set the slices on top of the steak, then cover the container and refrigerate for 1 to 2 hours. Heat a gas or charcoal grill to medium. Set the cheese in the freezer. Remove the meat and onions from the marinade and pat dry. Brush everything with a thin coat of olive oil, then season with salt and pepper. Place steak and onions on the cooking grate over direct heat and sear for 6 to 8 minutes. Turn the steak and onions and sear on the second side for another 6 to 8 minutes. Transfer the steak and onions to a platter. Remove the cheese from the freezer and use a vegetable peeler or paring knife to shave Boursin on top of the steak and onions. Cover with foil and set aside. Brush each slice of bread with oil, then grill them until lightly toasted, about 1 to 2 minutes. 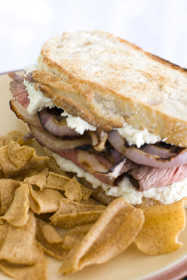 Thinly slice the steak, then assemble sandwiches with the bread, steak and onions.